The following are guidelines you must follow when creating and setting up scenes in which you intend to create game assets for Unity. Scenes You must create one scene for each character. A scene can contain all of a character's different animations and props, but should not contain several characters that need to act independently from each other. 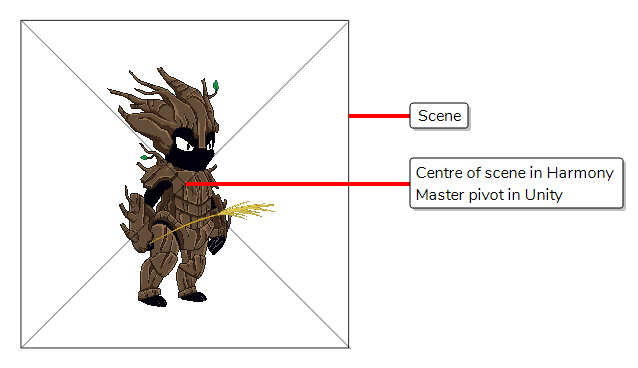 Your scene's resolution should be square, meaning its width and height should be equal. For example, 1024 x 1024 is a proper scene resolution for a game object. It is highly recommended to use a power of two for the dimensions of your scene, such as 64, 128, 256, 512, 1024, etc. This is because graphics cards naturally handle textures with such dimensions. While recent video cards will adjust to non-standard texture sizes, which might cause some overhead and slow down your game's performance, older video cards might not be able to display these textures at all. When imported in Unity, the master pivot of your GameObject will be exactly where the centre of your scene is. Hence, if you want the pivot to be at a specific position on your character in Unity, you should position your character accordingly in your Harmony scene. For example, if you want the pivot point of a bipedal character to be between its two feet, at the centre of its drop shadow, you should position this character so that the point in the middle of its feet is in the centre of the scene. Naming Do not use non-alphanumerical characters in scene, layer, drawing and group names. Only use letters, numbers, dashes and underscores. Unity does not support Unicode characters in names.